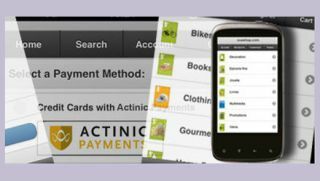 Ecommerce and shopping cart solutions business Actinic Online, has added its own low-cost card processing system, Actinic Payments, to the range of payment providers available to Actinic Online merchants. Powered by CreditCall, Actinic Payments offers Actinic Online merchants an affordable, secure payment processing option that accepts all major credit cards including Visa, Mastercard, American Express, Maestro and Delta, from just 16p per transaction. Enterprise levels of security - Actinic Payments is 100% PCI-DSS compliant (to level 1), has sophisticated fraud screening service as well as 3D Secure (Verified by Visa and MasterCard SecureCode), AVS for verifying a customer billing address and CVV2 (the 3 digit card verification number). Pay as you go – There are no set-up or monthly fees and pricing is per transaction so you only pay for what you use. The service is described as highly competitive, with price bands designed for all sizes of business. Full integration with Actinic's ecommerce products - Actinic Payments allows businesses to void orders, and refund clients from the Actinic Online back office, and will automatically add unsold stock back into the system. "Another major benefit of signing up to Actinic Payments is that merchants only have a single contact to resolve any technical or operational issues. And obviously, the very keen pricing model from 16 pence per sale, with no monthly fees, is attractive to retailers who want to preserve their margins in today's competitive online market."